The best vegan gravy recipe just in time for the festive season! Serve over seitan, millet pie or mashed potatoes. In a medium saucepan, melt margarine over medium heat. Whisk in flour and cook for 2 minutes. Add broth and bring to a boil, whisking constantly. Stir in remaining ingredients, lower heat and simmer for a few minutes until thickened. Just made the gravy, and it’s awesome! Salty, umami, rich. I’m going to serve it with a typical Dutch winterdish; a stew with mashed patatoes, carrots, onions and seitan sausages. I’m sure my family is going to love this! Thank you so much for this recipe! Wonderful gravy! It’s more of a fancy flavourful gravy then a chicken gravy. Anybody would like this. Thanks and keep up the great work! What a delicious gravy. I wanted to give my mashed cauliflower a kick. This gravy has so many levels of flavor, it not only brought my cauliflower to a gourmet status, but “roast seitan and gravy” sandwiches are also back on my menu. My family enjoyed this gravy alongside your Shepards pie recipe. I think the gravy tasted even better after it sat overnight in the fridge. We used the leftovers with a different dinner several days later. Would this also work with cornstarch instead of all-purpose flour? Hello, why is there maple syrup in the gravy an some of the savoury dishes? Can I substitute the miso? This was good, but too sweet for my liking. I’d reduce the maple syrup to maybe 1 tsp. I also added an extra 2 tbsp of flour to get a thicker gravy. It’s hard to get vegetable broth where am staying. Is there a simple recipe I can try? Can I substitute fresh onions for onion powder? Thanks! Sure, you can always use water instead of broth! Love your recipes, thank you so much. Any substitute for the margarine? It’s the oil that we don’t use and that’s what is in the vegan margarine. OMG!!! 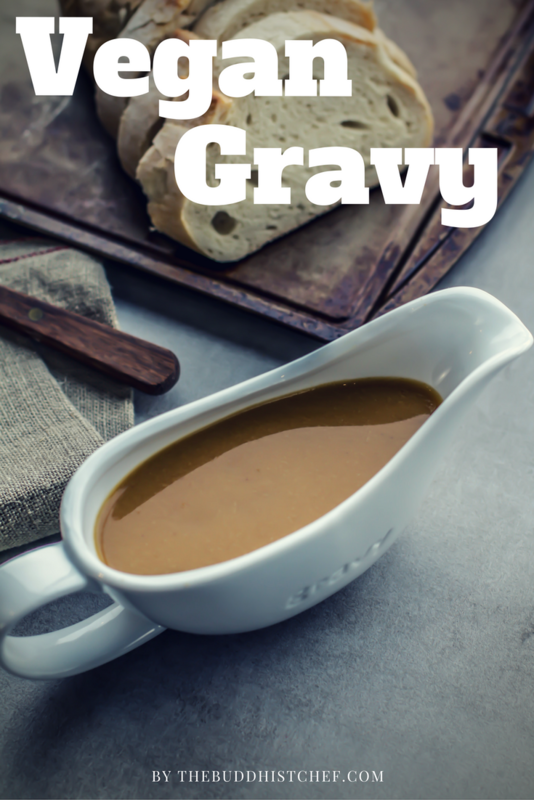 This gravy is fantastic and easy to make. I was so impressed with this recipe. I served it with the portobello steaks and roasted vegetables. It was amazing! Does it matter if you use red miso? I bought red instead of white. No problem but you might have to adjust the amount! Can leftovers be stored In the fridge? If so, for how long? Thanks! It tasted AMAZING by the way! This is a delicious gravy! I’ve made it multiple times and this is now my go-to when I need gravy. I’ve used a couple different broths. The best one so far that I’ve used is by a company called “Imagine.” It’s an organic, low-sodium veggie broth. I just tried it with Swanson because that’s what I was able to get last minute. Oh my god, the salt was overwhelming and I didn’t even add anything in. If your gravy is too salty, try adding in a couple drops of lemon juice at a time and a little more of the maple syrup. That got it back to how it usually tastes. This gravy is just so tasty, though! Before I went vegan, I never even used to like gravy. This has converted me to a gravy-lover! Thank you. Oh! And it freezes really well, too! I put my leftovers in the freezer once and it tasted just as delicious reheated. Wow! Just Wow…great, great recipe. Thank you! Wonderful recipes (Portobello mushrooms, roasted veggies and gravy) and simple enough for me. What is the purpose of the nutritional yeast? I love this gravy, it’s my go-to for a roast dinner, or anything similar I can think to put it with. I am making it this weekend and one of my guests is gluten intolerant, is there an alternative to all purpose flour I can use? I imagine Gluten free flour would have been fine.. or garbanzo bean/chickpea flour. I’ve used chickpea with good results. I first made this gravy at Christmas two years ago for my vegan daughter. Everyone loved it so much that even the meateaters request it. Thank you for a great recipe!